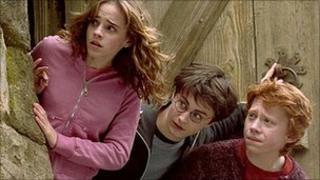 Harry Potter and the Prisoner of Azkaban has been named film of the decade at the First Light Awards. Producer David Heyman said it was an "honour and a privilege" to receive the award at a ceremony at London's Odeon Leicester Square. The prize, voted for by the public in association with the Bafta Kids' Vote, was chosen by children aged five to 15. Prisoner of Azkaban was up against other films including Shrek, Whale Rider, Happy Feet and Up. Heyman said: "It's especially exciting and moving to be voted Film of the Decade by children aged five to 15. "We made the film for children of all ages from from to 105 really, but clearly a core part of our audience is young people and to be honoured is a privilege." Clemence Poesy, who plays Fleur Delacour in the films and presented Heyman with the award, said she was sad the franchise was coming to an end this summer. "I remember my last day of shooting which was the last day for a lot of people, and some of them had been there for more than 10 years, so it really became very emotional," she said. The annual First Light awards celebrate short films made by young people. Supported by the National Lottery through the UK Film Council, it provides funding and help to enable five to 19 year-olds to make their own short digital films and media projects.